« who is going to 2011 convention? 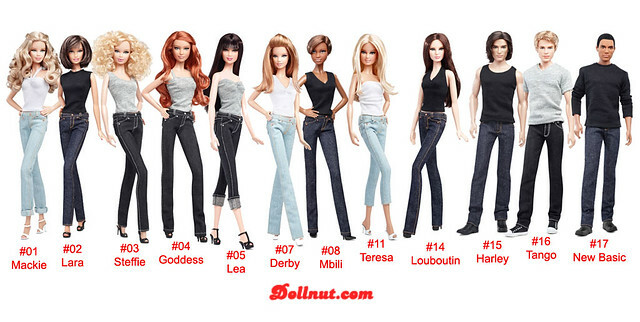 Barbie Basics 2.0 start hitting the shelf. the one I am most interested in is No. #14. I can live without the rest, but I know I’ll pick up a few along the way, such as No. #4, No. 5, … the boy dolls? no, I am not so interested in them right now, so I can wait. This entry was posted on December 26, 2010 at 1:28 am	and is filed under Dolly Daily. Tagged: barbie basics 2.0, barbie basics 2011, Barbie basics face molds, barbie face mold. You can follow any responses to this entry through the RSS 2.0 feed. Both comments and pings are currently closed. That’s a great larger image. Thank you! I haven’t seen them yet but I’ll grab whichever one. I’d like the whole set eventually! LOL! I have the entire collection 1.0, but I only picked 3 from 1.5 & Red collections. I would like to see more new faces, Model #1, #2 are in lack of changes. its tiring to see them again & again since their hair colors and facial make-ups are always the same. although #5 was popular, she should have tried new hair color for her presence in 2.0 collection. I basically stopped buying #8, b/c all the SIS dolls have this face mold, all the sudden I have too many of her. I found three today. They are nicer than I thought. They are tan and could be switched out with Fashionista bodies. No. 1 does look different with the curly hair. She’s the only one that looks much like the promo shots.